"We are primarily taking on new people in China, Brazil, India and Russia, but the traditional sites in Europe are also benefiting," Continental CEO Degenhart said. HANOVER, Germany – Continental expects to grow stronger than the world market in all five of its business units and will add staff to keep pace with demand. "We currently have nearly 160,000 employees worldwide and will be achieving sales of at least €29.5 billion this year," Continental CEO Elmar Degenhart told Automotive News Europe in an interview. During the economic crisis in 2009, Conti's headcount dropped to 132,000 employees and sales slipped to €20 billion. "We cover all growth fields in the automotive industry. ... We expect above-average growth compared with the global market in all five divisions. So it is obvious that we will continue expanding the work force appropriately, depending on how the global market develops." Most of Continental's growth will come from emerging markets. "This is why we are primarily taking on new people in China, Brazil, India and Russia," Degenhart said. "But the traditional sites in Europe are also benefiting from developments in the BRIC countries because we network our resources intelligently and use them globally." 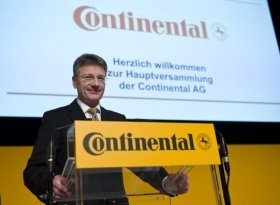 In China, Continental increased sales by 45 percent to €2 billion in 2010. Said Degenhart: "I see a very good opportunity to achieve a sales share of 30 percent in Asia in the automotive group by 2015," up from 21 percent in 2010. As in Europe, the core drivers behind this business are drivetrains, safety and networking, the CEO said. In the world's second-biggest car market, the United States, Continental has had big problems for years – particularly with its tire business. The company had to cut jobs to get back on track. "We now see good opportunities here, particularly in the tire market. Following a long period of drought, we have again achieved profitability here," Degenhart said. "We want to grow at a stronger rate than the market. We are expecting a market of 13 million light vehicles this year. In the medium term, we are again expecting 14 million to 15 million units."